Tire pressure for Toyo RRs? - Miata Turbo Forum - Boost cars, acquire cats. Taking my Miata to Thunderhill on Monday with a brand new set of RRs. This is my first time using them, and I dunno what pressure to run. I see some suggestions on the net to treat them like RA1s with pressure in the low 40s, but that was on a Spec E30 forum, not Miata-specific. Anyone have direct experience with them? 225/45R15s on Kosei K1 15x7s. (yes, the wheel is a bit narrow -- I already blew my tire/wheel budget for the year, so that's what I had available). No surprise here, a few of the spec miata forums indicate usage in the range of 32-37. I would start in the middle and change around see what you like best. Since you are mounting them on a narrow rim, I would run them on the high side to take out some of the flex. You saw his pyrometer data? Huh, where did you find that? I hunted all over the Toyo web site and only found recommendations for R888s and RA1s. Track day was yesterday, I ran 'em at 38 (too high), then backed down to 35, which seemed to work OK. I did a couple quick checks with the pyrometer, but didn't have a helper to check it right after coming off-track, so they had cooled for a while and the data was somewhat questionable. Datalog showed lateral grip between 1.2 and 1.3 gees -- that's almost as good as I get out of the A6s at autocross, I'm definitely pleased with these tires. You saw the pyrometer data from Codrus's car in California that hasn't run on RR's yet? Or you saw data from a similar car on the east coast? That is what I was asking. If so, please share. I have yet to run the 225/45's myself but have quite a bit of experience with the 205's as you know. How do you get your data? 1.2/1.3 is that sustained? or peak-ish? I've only had one chance to run my 225/45 RR's on track, at PIR. About 50deg ambient on best lap. 9" rim, I went with 32 hot. -2.5/-2.3 F/R camber. These measurements are GPS-derived from my Aim Solo. I have no pyrometer data, sorry. PIR is run CW. 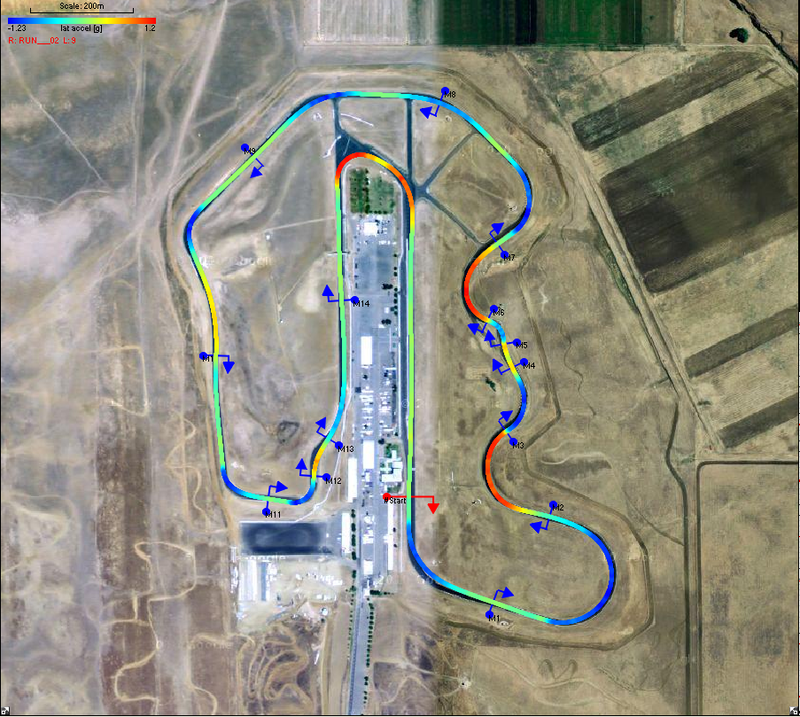 There is only one high-speed left-hand turn(Turn 10, ~90mph), which is where I saw the 1.6G reading. Apparently the CoT wing and the front lip are more effective than I thought. I have a Race Technology DL1 data logger (Products » Data loggers - Racing - Race Technology Ltd - Automotive Technical Excellence The DL1 is an older unit that they don't sell any more), it's a combo GPS and 3-axis accelerometer system, plus a dozen or so analog inputs. The analysis software for it made that map above. For Thunderhill on Monday, it showed 1.38 peak left, 1.25 sustained; 1.28 peak right, 1.2 sustained, and 1.2 peak decel, about 1.1 sustained. I'm a little suspicious of the braking numbers, that's a lot more braking that I've ever seen on my A6s. Autox doesn't have the kind of sustained braking zones as the big track, though, so maybe that explains it. Thunderhill only really has 3 right-handers, 2 of them are off-camber (3 and 5a), and the last one is 14/15 which is not my best corner. No aero on my car. Quick Reply: Tire pressure for Toyo RRs?